We're so excited to offer another exciting Summer Art Camp at Ten4 Art Studio this year. 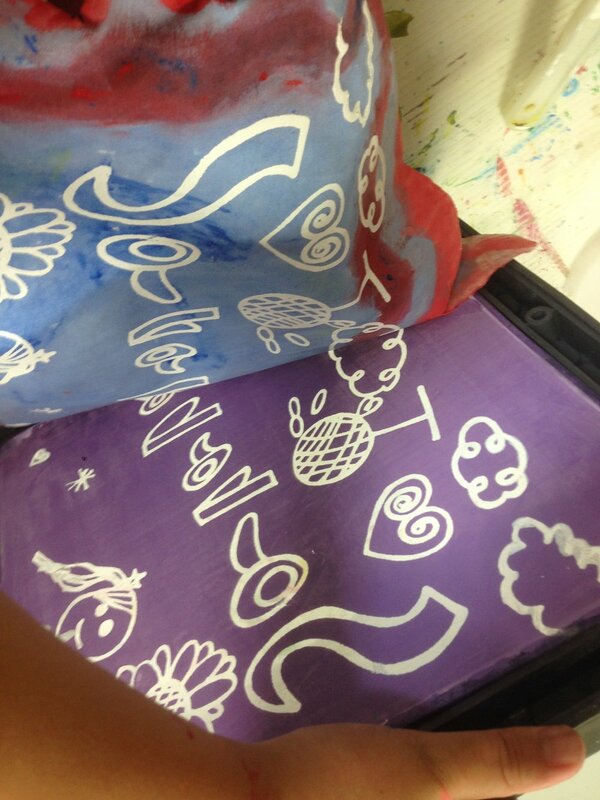 Each week (morning and afternoon session) we offer a different theme with various fun art projects. We value the way children interpret these projects in their own ways and encourage a mixed-age group as younger and older children can learn so much from working side by side and collaboratively on projects. Each camp will be focused around a specific medium or theme -- there's something for EVERYONE! Come explore, imagine and create! Sign up for Summer Art Camp 2018 today! * Specific projects listed below are subject to change without notification; Photographs of projects are examples of what students have done in the past, not necessarily what they will be making during the week. 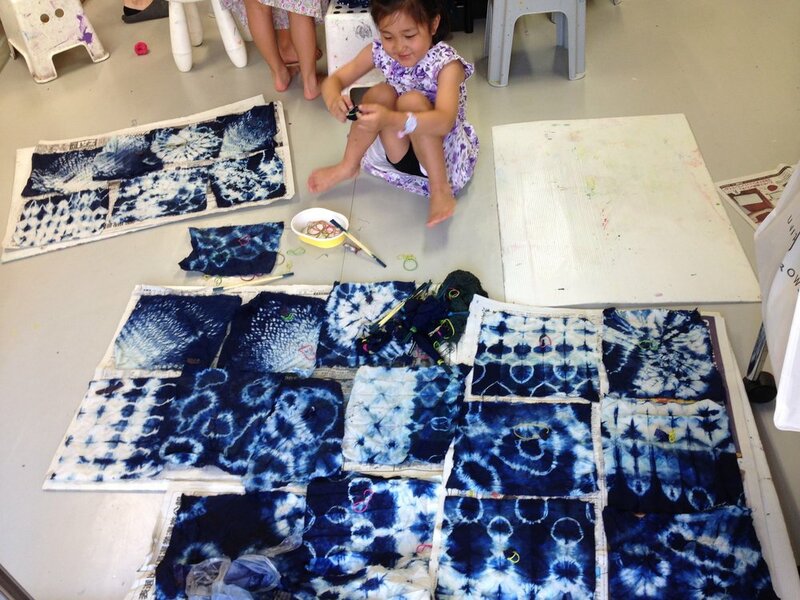 This week we'll investigate fashion design and the versatility of fabric through various methods such as tie-dyeing, marbling, painting and faux-batik. Create a unique top, a one-of-a-kind neck piece, bag and a hat using upcycled materials that you can admire and use. Through design sketches, making miniature samples on a small mannequin, we will explore the behind the scenes life of becoming a fashion designer! Students will design and build a 3D project of their dream treehouse. This week we will focus on designing elements, using problem solving skills and collaborating. Their treehouse will be complete with ladders, pulleys, furniture, people, and more that they can play with. At the end we can line up everyone's artworks and see a wonderful scenery of treehouses all assembled together as a whole. Come build a treefort, a project that invites endless imaginative play! This week is all about 3-dimensional artwork. Students will explore various materials such as wood, clay, wire, cardboard, plaster, traditional paper mache supplies, and upcycled supplies, while looking at some famous artists for inspiration. They will look at Pablo Picasso, Frank Stella, Tara Donovan and Andy Warhol. Projects include both kinetic and static free standing sculptures and relief works. From impressionist artists to modern artists, students will study some famous artists and make projects inspired by these artists. This year, students will explore artists such as Claude Monet (just in time for the exhibition at the Yokohama Art Museum! ), Frida Kahlo, Claes Oldenburg, and Jasper Johns learning about each artists' ideas and processes in creating their artworks. Each student will be encouraged to create and develop their own techniques and preferences. Unleash your inner creative genius! Plan, build, construct, engineer and create. Build your problem solving skills using creative, hands-on activities as you draw, design, explore and make observations based on challenging architectural and engineering themes about structures, gravity, movement and potential/kinetic energy. Projects will include a geodesic dome, bridge structures, and a pinball machine. Be ready to put on your thinking caps! Let's explore various kinds of liquids, and combine art and science. We will experiment with some ingredients such as salt, oil, soap, natural dye, and vinegar and look into colors, various states of water, viscosity and more! We will create marble prints, paintings, dyed fabric, lava lamps, a miniature water wheel, and even make bubble snakes and build a collaborative water wall. *Please note that we will use some food items. Contact us if you have any allergy concerns. Learn traditional and non-traditional styles and techniques and experiment with various mediums such as watercolors, ink, tempera and acrylics to create portraiture, landscape paintings, still life drawings, and mixed media. We will explore composition, color theory, proportion, perspective and value, and also learn to build observational skills. Use this opportunity to experiment with various tools and develop your individual artistic style. Let's explore stop motion animation with inspirations from world-renowned film maker and artist Tim Burton. We'll make clay objects, props and background drawings and make a collaborative set design with other students. With the aide of technology, let your imagination come to life! Build your STEM (Science, Technology, Engineering, Mathematics) skills using creative, hands-on problem solving activities. MASKS, MINIATURES, MOSAICS + MORE! This week is all about fun, awesome projects! We'll squeeze in a 3D mask, a tile mosaic, a miniature world consisting of houses in a faraway land, and more! Let's travel around the world and get inspired by various arts and crafts and beautiful sceneries. Come join a week filled with an assembly of amazing creations. How would you like to decorate your room with DIY projects? Students will create mood boards, make a plan of your room, think about colors and textures to create projects from unique light sources to pillows, a hanging tapestry, a cool clock and more! Projects will include designing your products, indigo dyeing, printmaking, marbling, stencilling, painting, and constructing various materials and textures. Perhaps you can make a furniture or item that you've always dreamed of! *Register for two camps or more and get a discount. Sibling discount also available. Please contact us for details. * Any child who is participating in the morning or afternoon camp, or both can register for lunch. * ¥1200 per day from 12:30pm - 1:30pm. Children must bring their own lunches (nut free), snacks, and a water bottle. * Afternoon session will start at 1:30pm. If you child is not registered for the afternoon session, please pick up your child by 1:30pm at the latest. * If weather permits, we will take a short break outdoors in a local park. * Lunch is available on the last day. We will hold a small gallery show of the students' artworks on the last day. Click here for payment, refund and cancellation policies for workshops.